How Does a Cleaner Work? What are the Hazards Found in Some Cleaners? How do I know If My Cleaner is Hazardous? What Does "TLV or PEL" Mean? What Do Toxic and LD50 Mean? Why Do Other Cleaners Contain Hazardous Materials? 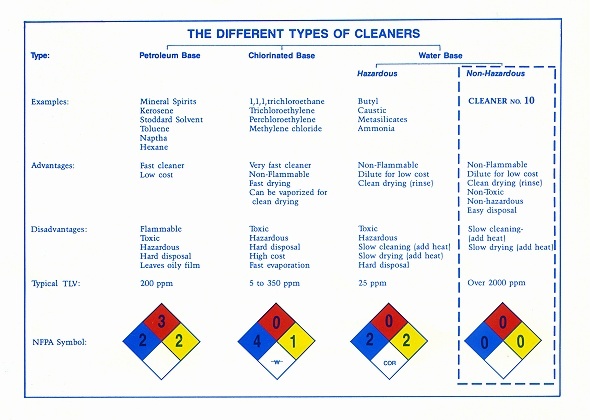 Why Doesn't CLEANER 10 Contain Hazardous Materials? What Does CLEANER 10 Contain? 1. Solvent base cleaners remove grease and oil deposits by thinning out the deposits. This spreads the deposits over a larger area or volume, but not completely cleaning the surfaces. The only way to get a completely clean surface is to rinse with clean solvent, or with vapor degreasers. 2. Water base cleaners emulsify, or break up, the grease and oil deposits into extremely small particles and remove them from surfaces. A detergent action then keeps these particles in suspension. Rinsing with fresh water makes the surface completely clean. Oils can sometimes separate and float to top where they can be skimmed and the cleaner reused to reduce hazardous waste. 1. Health hazards include dangerous effects to the body by breathing (inhalation), contact with skin or eyes (irritation), or swallowing (ingestion). 2. Fire or flammability hazard. 3. Reactivity hazards are dangers resulting when a substance is in contact with another substance, or when a substance bums forming poisonous, or toxic, gases. 4. Special conditions to avoid, such as high temperatures, high humidity, sparks. Surprisingly, many substances react with water to produce hazardous conditions. 1. Ask for and read the MSDS (Material Safety Data Sheet). Ask your salesperson before you buy. Look especially at Section 2 of the MSDS. It must, by law, list all hazardous materials contained in the product. If you cannot obtain an MSDS before you buy, be suspicious. If there are no materials listed, ask your salesperson to be sure. Call the factory and request information. Refer to our chart on the next page. If your product is anything but water based, it almost always is hazardous. 2. Read the label on the container. If it warns of "high alkaline" or "hazardous fumes" or "flammable" or "skin irritation" it contains hazardous substances. 3. Measure the pH with a meter or paper color-strips. If it is very high (above 13) it probably contains caustic or metasilicates, both hazardous substances. If it reads very low (below 2) it probably contains hazardous acids. 4. If the product is hazardous, it usually carries the NFPA (or similar) color-coded warning label. WHAT DOES "TLV" or "PEL" MEAN? TLV is "Threshold Limit Value" and is associated with inhalation, or breathing of the vapors. It can also be called PEL, or "Permissible Exposure Limit". TLV is the allowable concentration of substance vapor (expressed as "ppm" or parts per million) in air, for a normal 8-hour workday, 40-hour workweek, to which nearly all workers may be repeatedly exposed, day after day, without adverse effect on health. These adverse effects could include lung disease, cancer, long-term illness. The more hazardous the substance, the less concentration is allowed, and therefore the TLV, or permissable exposure, is lower. OSHA has classed any substance with a TLV less than 500 as "hazardous". 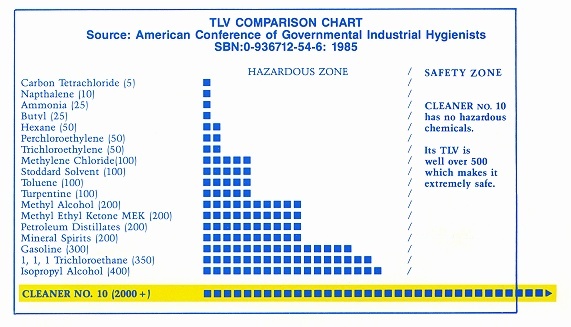 A TLV greater than 500 is classed as "non-hazardous", such as CLEANER 10, which has a TLV greater than 2000. Most chlorinated and petroleum based solvents have a TLV less than 500 and are therefore classed as "hazardous". The LD50 is the dose given to ten test animals (usually rats) and five or more die. This is referred to as the Lethal Dose which kills 50% or more animals. A substance is toxic if the LD50 is 0.5 grams or more per kilogram of body weight (about 3 ounces for a 200 pound person). CLEANER 10 Was legally tested at a dose of 5.0 grams (ten times the allowable or about 1 pint for a 200 pound person) and none of the animals died. They all remained healthy and gained weight. A product is rated for flammability depending on its Flash Point (the temperature of the product at which it will ignite if exposed to a flame). Refer to the NFPA ratings below. A product having no Flash Point, no matter how high it is heated, is classed as "0" or "Non-Flammable", such as CLEANER 10. A Caustic is a substance which burns or eats away by chemical action. Caustic Soda is Sodium Hydroxide (also known as Lye). Caustic Potash is Potassium Hydroxide. Even solutions as low as 1% of either of these caustics can eat away your skin by permanently destroying the keratin, or outer protective layer. Permanent blindness is usually the result of even momentary eye contact with caustics. CLEANER 10 was legally tested on animals at full strength. Even with no water flushing, there was no permanent damage to the eyes of test animals. Because they are inexpensive. Manufacturers know that most users do not take the time to become aware of the dangers of these products. They also take advantage of the fact that most users are under pressure to get the job done quickly and "who cares about the worker?". Because the makers of non-hazardous CLEANER 10 believe that the health of the user IS important. We have discovered a way to blend several substances in a way which produces the same effective cleaning power as the hazardous cleaners, at a cost comparable to hazardous cleaners. It is water-based and contains a scientific blend of emulsifiers, coupling agents, detergents, bubbling suds, specialized builders, surfactants, fragrances, and Certified FD&C colors. Catalyst HITELV, a scientific blend of high efficiency ingredients enhances the cleaning power of CLEANER 10. Emulsifiers break dirt and grease into small particles. Coupling agents allow grease and water molecules to combine so they can easily be washed away with plain water. Detergents keep dirt and grease particles suspended in solution so they are completely removed. New dirt will not form so quickly. This allows a longer time between cleaning jobs. Bubbling suds act as "automatic scrubbers". Each time a bubble breaks it scrubs off a little more grease and dirt. CLEANER 10 automatically reduces the need for scrubbing saving your labor costs and time. Specialized builders clean dirt from hard surfaces, reducing need for scrubbing. They also condition the water, eliminating need for water softeners. Surfactants are SURFace ACTive AgeNTS which lower the dynamic surface tension of your cleaning solution, making it wetter to penetrate fast, giving CLEANER 10 the ability to work faster. CLEANER 10 has a citrus fragrance added to make it pleasant to use. A certified food-grade FD&C coloring agent is added so you can see the dilution you are using for each job. Even though the amount of coloring agent is less than .005%, we use only FD&C agent as other agents are usually hazardous. We guard your health all we can.